Did you see my Home Tour on Monday? Have you visited the other great houses on the Summer Showcase? (the full line up in my post.) I was totally holding back when I shared the pictures of my kitchen Monday because I had just finished this awesome project! Like I shared on Monday, when my husband and I built the house last year we were able to chose all of the finishes. I spent a ton of time choosing what I wanted for the kitchen. I had dreams of light ivory cabinets and dark granite with a white subway tile backsplash…it was beautiful-in my mind! Fast forward to the day my husband and I actually went to the builder supply to pick our finishes in person and the salesperson took one look at our out of control rowdy pack of three boys and gently suggested I choose a darker cabinet color. He gave me the example of one of the boys getting a hold of a Sharpie just once and I’d never be able to restore the cabinets. In retrospect it was a pretty melodramatic sales pitch but it scared me and I went with the dark cabinets and lighter granite instead. When the people in charge of the tiling asked me for the grout color in the kitchen I was already so burnt out by the process I just wanted it to be finished…I ended up opting for bright white grout to go with the bright white tile, concerned that a darker grout would be too dark with the dark cabinetry. It makes my stomach hurt just remembering that process…making decisions is hard for me and the entire home building process positively turned my hair gray! Fast forward a year and both my husband and I were regretting the white grout and started talking about the pros and cons of changing grout color. We love subway tile but you could barely see that our backsplash was subway tile without the definition between the tiles. 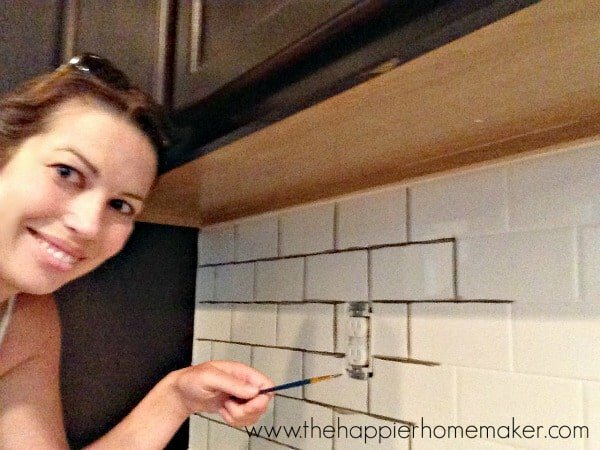 We were talking about it last week and thought about trying the Grout Refresh that I talked about in my post on restoring and sealing your grout. I was nervous about going darker instead of just restoring it to an original finish but we decided to go for it. Twelve dollars later and we were on the fast track to dark grout! This is me painting on the Grout Refresh with a craft brush. My husband “helped” by removing all three outlet covers and refilling his coffee cup for the island instead of the counter. He’s a trooper. To use the Grout Refresh just paint it on (I used a cotton swab to apply it on my bathroom floors) and leave it for 30-60 minutes. You can totally leave it on longer, don’t stress about leaving it too long, I’ve left it over a day before and it was fine. After the time has elapsed spritz it with water and then scrub off the excess with a sponge. I have to admit I was still feeling pretty nervous when I painted it on because even though I was using a paintbrush the lines looked big and really dark. However, when I started to scrub it away I was immediately relieved with how it looked-you can see on the right pic above, the left side has the excess wiped off and the right side shows before I wiped off the excess. The difference is subtle but I am in love with it…now you can see the subway tile but it’s in no way obtrusive. I’m so glad we took the plunge and gave it a shot, and it’s a bonus that the entire project cost under $15! Not too shabby for a high impact DIY? What do you think? Do you like it better before or after? Can you see the difference? 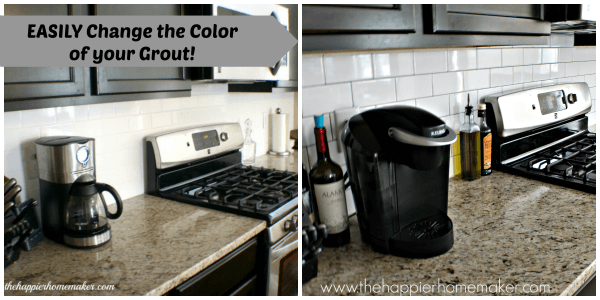 Just came across your blog searching for how yo change your grout color. I’m literally in the same position you were except mine is our white subway tile master shower. We built and are about to move in in a few weeks. We chose white grout and now I am not a fan and my husband will kill me if I tell him. This may be an easy solution to try…. That’s exactly how I felt too-the white on white seemed to make it look flat. This was a super easy solution (and inexpensive) let me know if you do it! I’d love to see a before and after! Hi Jim, once you apply it and rub off the excess per the instructions it will be permanent. I can’t vouch personally for long term, I only have about 4 years worth of wear on my original application but so far it’s holding up beautifully! We remodeled our kitchen last year and we have white subway tile with white grout up and around our windows and though I like how clean and subtle it is I’ve often thought I should have maybe gone with a very light grey or silver. Is there that color? So dark grey is what you used? I just had white subway tile put in my kitchen also. I let the contractor talk me into white. I was immediately disappointed. I’m sure the reason he chose white is because he already had it. I was thrilled to find your website!! Is there a particular brand I should buy? Thank you for this post. 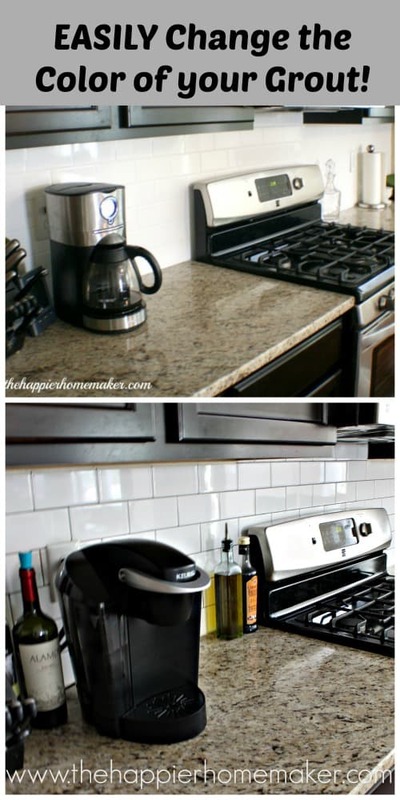 I have the same exact issue: white tile, white grout and it look as if there is no backsplash. Have been to nervous to make a change. Came across this post and now I am going to try the charcoal. Thanks!!! Now that is has been a few years, any suggestions? Is it still holding up okay? I am not sure if the contractor used a sealer, any issues if he did? This is EXACTLY my problem. 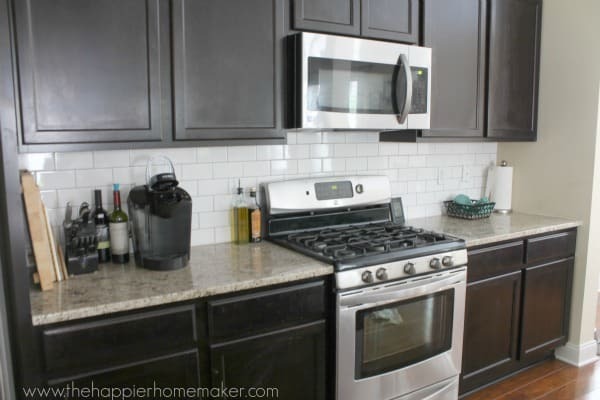 We did a beautiful white morracan backsplash but I made the mistake of using white grout. From far away it looks like a white wall. You can see the back splash. Thank you for posting!! I absolutely love my backsplash now. Thanks to this website I was able to do it myself. Very easy and not expensive! This looks great. I just had subway tile installed in my bathroom and the “light grey” grout we used looks like a dingy beige. Can you recommend a true lighter grey? I have white and grey marble countertops to give you an idea of the color I’m using. Thanks! Mapei wRm gray from Lowes! Hi! Painting mine now. Did you have to paint two coats? I’m finding that when I’m scrubbing the excess off that there are spots on the actual grout line that the paint came off. Project gone bad. What’s your take? I don’t think the dark would show through, it held up well without fading for us but obviously, I can’t say for sure.